In this interview series, we speak with employees who were nominated by their teams as having a strong entrepreneurial spirit. Entrepreneurship is a key indicator to success for employees starting their careers in the Enterprise Management Training (MT) Program. Bethany joined the Management Training program in Houston last year. 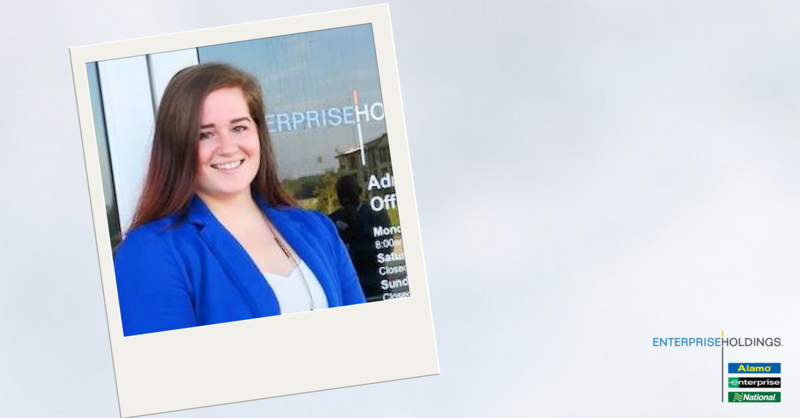 She shares how she made the switch from personal trainer to a career at Enterprise and what she’s learned so far about teamwork, a positive attitude, and using her entrepreneurial drive to find success at the company. How did you get started at Enterprise? I was working as a personal trainer when I realized that I wanted to find a long-term career opportunity. A friend who had been working at Enterprise since graduation suggested I might be a good fit at the company since I enjoy interacting with and helping people. What did your career dreams/goals look like before you started at Enterprise and how have they changed since? I originally wanted to own my own gym. Now my day-to-day focus is to be better than I was yesterday. Whether it’s with service or sales, there are always ways to strive and better myself. Right now, my goal is to move up in the MT Program. What is the most valuable lesson you’ve learned at Enterprise? The importance of thinking long-term. I’ve always been the type to take action and want results right away. I’ve realized that things don’t change overnight – it takes long-term effort to build a career. In the meantime, I focus on making every day great. I look forward to working with my team, greeting regular customers, seeing new faces and offering up the smile that might make someone’s day better. What has surprised you the most about your career so far? What’s surprised me is how fast I’ve been able to achieve goals and pick up so many new skills. Having team members and mentors to turn to with questions helps in the process of building those skills and my career. When a situation arises, there is always someone who can offer advice that allows me to learn from their past mistakes and find out how they might have dealt with the issue differently. What is your favorite part about working at Enterprise? The people. My Enterprise team feels like a family. Everyone wants to support and help each other improve. What advice would you give to someone with an entrepreneurial spirit looking to build a successful career? You’re only as strong as your weakest point. It’s important to be well rounded and open-minded. If you know you struggle with something, find a way to work on it and make it a strength. Other people may be smarter in marketing or with numbers, and it’s okay to not always be the best, but be willing to learn. I set goals for myself every day. I always want to do better than I did before. When I have something to look forward to or work toward, I push myself. At the end of the day I check in and ask myself if I could have approached anything differently. I’m all about reaching goals, trying to achieve new things and finding ways to help others.